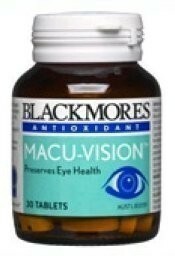 Product Use : The formula provides nutrients important to the macular region of the eye. The antioxidants zinc, copper and vitamins C & E, play a significant role in defending against free radical damage in the macular region, retina and lens of the eye. A medium sized white/yellow-brown, oval shaped tablet with a break bar. Film-coated light yellow. The formula provides nutrients important to the macular region of the eye. The antioxidants zinc, copper and vitamins C & E, play a significant role in defending against free radical damage in the macular region, retina and lens of the eye. The exact mechanisms are not fully understood, but the likely overall benefit is due to the overall antioxidant actions of the vitamins and minerals. The formula provides nutrients important to the macular region of the eye. The antioxidants zinc, copper and vitamins C & E, play a significant role in defending against free radical damage in the macular region, retina and lens of the eye. * Convenient once a day dosage. * Antioxidant formula for eye health based on the AREDS research# * Contains natural vitamin E.
* Vitamin C (Ascorbic acid) 250mg * Natural Vitamin E (d-alpha tocopheryl acid succinate 165mg) 200IU * Zinc oxide (Zinc 40mg) 49.8mg * Cupric oxide (Copper 1mg) 1.25mg . * Contains zinc, which may be dangerous when taken in large amounts or for a long period. * Not recommended during pregnancy. * Always read the label. Use only as directed. May occasionally cause gastric irritation if taken without food.